When you look at the River Stour and its tributaries they may give the impression of being clean and healthy. But are they? The ‘health’ of a river is determined by its capacity to support a variety of life. This is termed the river’s ‘ecological status’. Under the Water Framework Directive (WFD), rivers are classified by one of five ecological statuses: High, Good, Moderate, Poor and Bad. Good status rivers will support a thriving mix of flora and fauna. 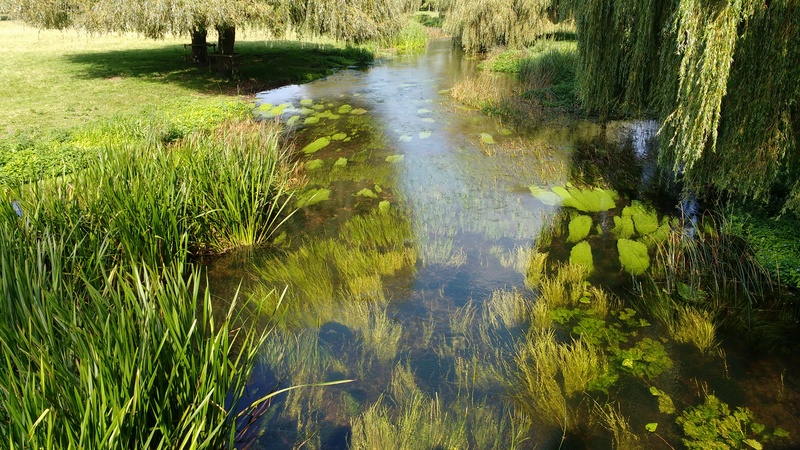 For monitoring and classification purposes the Stour Catchment is divided into a number of discrete river water bodies: twenty in all. The latest publically available monitoring (2016) indicates that most of these – twelve – are at Moderate status; seven are classified as Poor and one – the River Dour – is classified as Bad. The Environment Agency and its partners are committed to get as many water bodies as possible to Good status by 2027. This shows we have much work to do to make our rivers healthier for people and wildlife. So what causes a river to have a poor ecological status? There are a number of factors that impact on a river’s capacity to support life. One of the obvious ones is the chemical make-up of the water. Obviously polluting or contaminating inputs to the river will make it harder for a diverse range of species to survive. Sometimes this is because one species is able to adapt to or tolerate the conditions more than others and will become dominant. This is often the case where watercourses have high nutrient levels. Nutrients can enter the river in a number of ways: from sewage treatment works, from agriculture and industry, and surface water discharges from urban areas. Phosphate levels are a particular concern in the Stour system. Fortunately when phosphate levels are reduced many species can recover relatively quickly. Over recent years Southern Water Services have invested in phosphate reduction at sewage treatment works across the Stour catchment. We are starting to see the benefits of this investment in lower phosphate levels in our rivers. 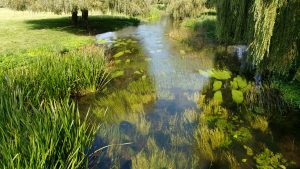 Farmers are playing their part too: the Catchment Sensitive Farming initiative, overseen by Natural England, has the Stour as a priority, and many farmers are modifying their methods to reduce nutrient inputs to the river. Also, the quality of urban run-off is being improved by using sustainable drainage systems (SuDs). Ashford Borough Council has been at the forefront of developing policy to ensure water is considered at the heart of urban design. Another factor that is important is the flow in the river: obviously the more we take out of the river for human, agricultural or industrial consumption, the less there is left in the river to support life. Although most of the water we use in Kent comes out of underground aquifers, these same aquifers feed water into our rivers. That is why it is important for all of us to use water wisely in our homes. Another factor that impacts greatly on the Stour catchment is the physical interference of man. Throughout history the river system has been managed by man, whether for drainage, flood risk management, navigation or to power mills. These activities can have a detrimental effect on the river. For example, weir structures often slow the river down to such an extent that silt settles out and smothers the gravel bed. Weirs can also obstruct the migration of fish. Removal or modification of structures can prove complex due to the complications of ownership as well as the technical difficulties. It can also be expensive. A major obstruction to fish passage was identified at Pledges Mill in the centre of Ashford. In 2013 this structure was modified to allow fish and eel passage as well as improve flow conditions to reduce siltation. This project cost over £200,000 and there are over 30 mills on the Stour system! Our rivers can also be improved by returning artificial river-banks to a more natural state. Much work has been undertaken throughout Canterbury to achieve this. As previously mentioned, we have a target to bring our rivers up to Good status by 2027. This may seem a long time in the future but it is imperative that we start as soon as possible. Many of the activities that have had a negative impact on our rivers date back hundreds of years. We have just ten years to put things right; we all need to work together to achieve this. Fortunately we are not starting from scratch; much has already been done and much more is planned.